Today's Thank You goes to YOU. You made my day - many of them, in fact! I've challenged myself to create a card every day over the last few months. Its been difficult, as most challenges are meant to be, but the response and support from you have meant so much. Thank You!! 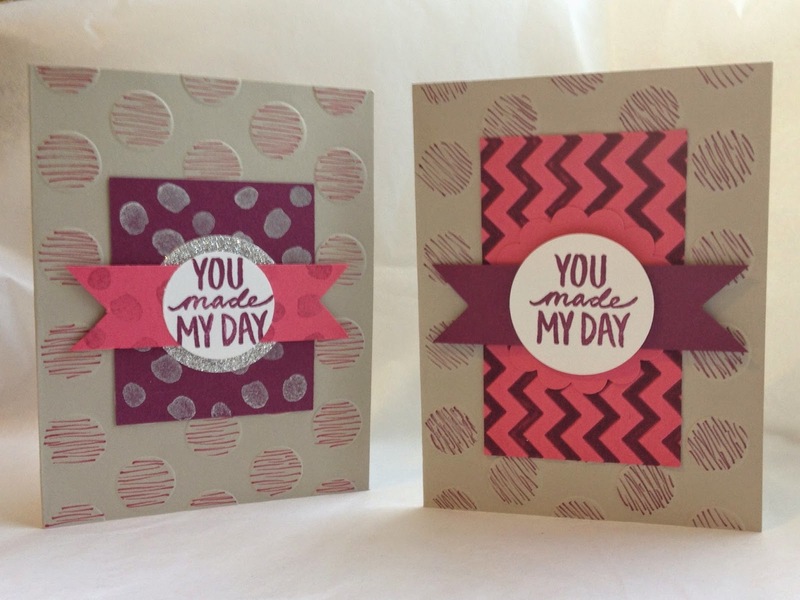 This is another set that will be available January 6th, as part of the Sale-A-Bration brochure. For every $50 purchase, you'll be able to add on a product from the brochure for Free! These limited edition stamps, papers, and embellishments will be available only until March. Great stuff, wait till you see it!! 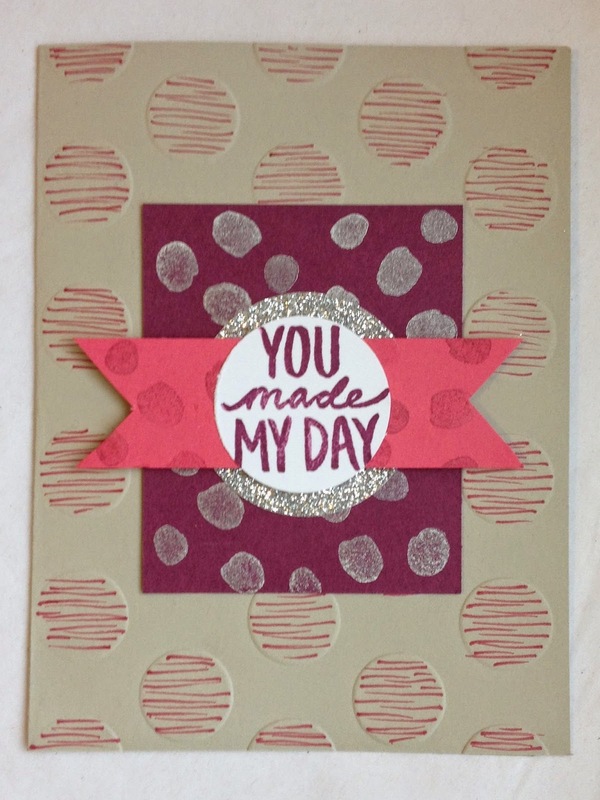 Today I used a Sahara Sand base, embossed with the Polka Dot Textured embossing folder. I CASE'd a design from the Sale-A-Bration 2015 brochure, and sketched in the dots with a marker. Looking back on the photo, I suppose this look could also be done using the Dots and Stripes Decorative Masks, but I like how it came out as it is. I swiped the marker from the edge of the circle across almost to the other edge, and then came back from that edge to the first side, creating a sketched dash across the circles. Its subtle, but fun. Very fun!! :-) I made the marks in time with the songs playing on my radio, it was like dancing with my markers! For the first card the embossed dots are sketched in Strawberry Slush, all going the same direction as the Strawberry banner layer. 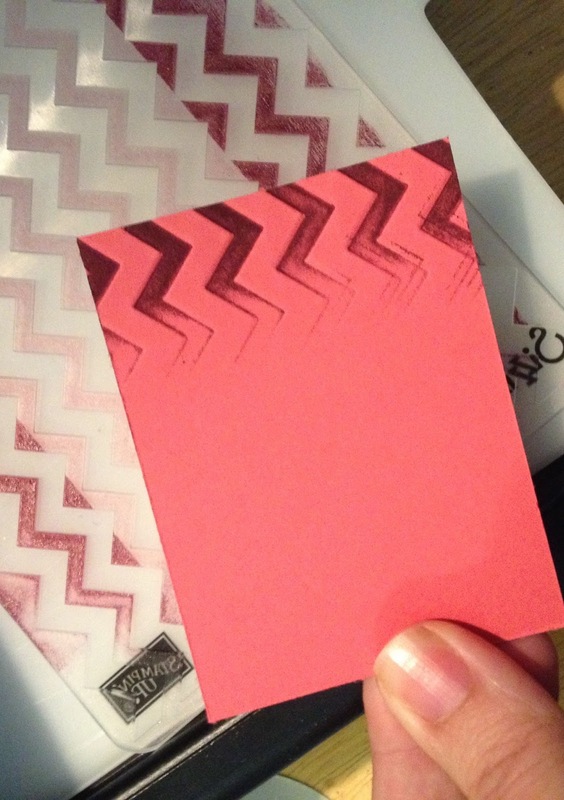 Next, I stamped a Rich Razzleberry layer with the the dots in Silver Encore ink. Then a circle punched from the Silver Glimmer Paper, stacked with a banner in Strawberry Slush (stamped in the dots again, stamped off first for a faded effect), and lastly the Circle of Whisper White stamped in Rich Razzleberry. Interesting details to try out, I liked this card. The second card is bolder. 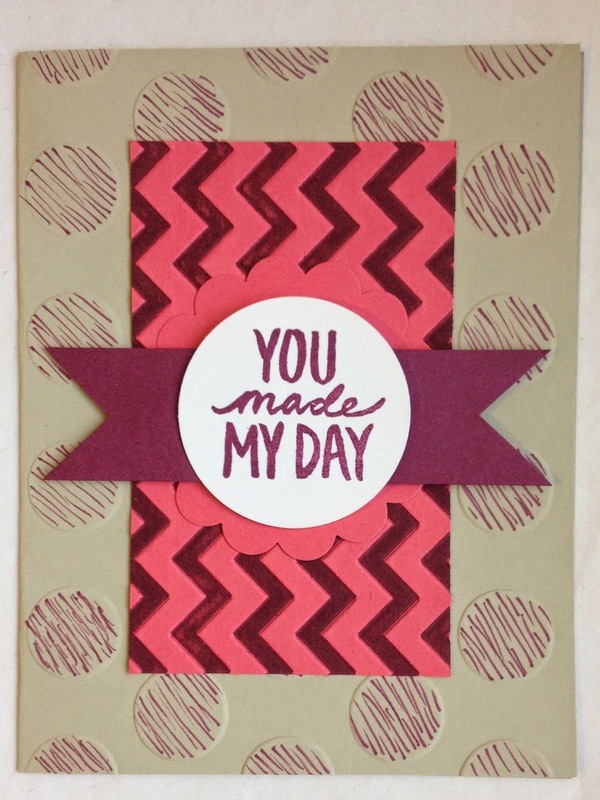 The embossed dots on the base are sketched with the Razzleberry marker, but I didnt really pick a direction, they are going kind of askew of anything on the card, maybe matching the zig in the Chevron embossed pattern on the next Strawberry layer. Maybe. Atop this layer I placed a plain Strawberry scallop circle, and then a plain Razzleberry banner, topped with the White circle stamped in Razzleberry. Swipe ink across folder, insert paper and emboss, voila! On the Strawberry layer I used the technique where you swipe your ink pad across the embossing folder, transferring color to the embossed image. (shown above is the scrap left after I cut the piece for my card. Fun technique, if a bit messy. I'm looking forward to even more creativity and sharing in the new year. 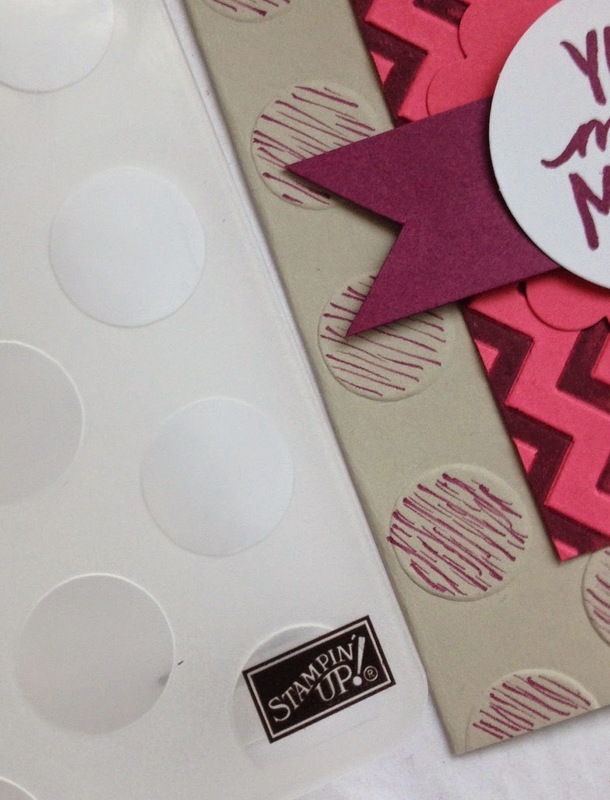 click on any image to see more information in my online Stampin' Up! Store.